These are about the size of a golf ball. Or just to be nostalgic around the same size as one of those marbels that you were always envious of in the school playground. Gobstoppers, known as jawbreakers in Canada and the United States, are a type of hard candy. They are usually round, and normally range from about 1 - 3 cm across; though in Canadian/US candy stores, some stores or stands in Europe and many theme parks, gobstoppers can sometimes be up to 8 cm in diameter. The candies are traditionally very hard, hence the descriptive name of jawbreaker. 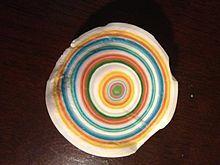 The term gobstopper derives from 'gob', which is slang in United Kingdom and Ireland for mouth. The sweet was a favourite among British schoolboys between World War I and World War II. In his children's book Charlie and the Chocolate Factory, British author Roald Dahl described "Everlasting Gobstoppers", a fictional type of gobstopper that could never be finished. Gobstoppers usually consist of a number of layers, each layer dissolving to reveal a different colour (and sometimes differently flavoured) layer, before dissolving completely. Gobstoppers are sucked or licked, being too hard to bite without risking dental damage (hence the name jawbreaker). Gobstoppers have been sold in traditional sweet shops for at least a century, often sold by weight from jars. As gobstoppers dissolve very slowly, they last a very long time in the mouth, which is a major factor in their enduring popularity with children. Larger ones can take days or even weeks to fully dissolve. Gobstoppers are made by slowly depositing layers onto a core (such as a pressed ball of sugar or a gumball). Gobstoppers are made in large, rotating, heated pans. This is called "hot panning". The candies take several weeks to manufacture, as the process of adding liquid sugar is repeated multiple times. Natural and artificial colors and flavors are also added during the panning process. The Everlasting Gobstoppers, sold under Nestlé's Willy Wonka Candy Company brand, were first introduced in 1976 by Breaker Confections, and are named after the Everlasting Gobstoppers in Roald Dahl's children's book Charlie and the Chocolate Factory. In Dahl's story, Everlasting Gobstoppers are purported to last forever. Dahl named the sweet after Gobstoppers, which were a favourite among British schoolboys between the two World Wars. As a young boy in the early 1920s, Dahl put a dead mouse into a jar of Gobstoppers in his local sweet shop, which is commemorated with a blue plaque. In 2003, Taquandra Diggs, a nine-year-old girl in Starke, Florida, suffered severe burns, allegedly from biting down on a Wonka Everlasting Gobstopper that had been left out in the sun. Diggs and several other victims' families filed lawsuits against Nestlé for medical bills resulting from plastic surgery as well as pain and suffering; the matters were later settled outside of court for an undisclosed amount. A 2004 episode of the Discovery Channel television program MythBusters featured a myth called Exploding Jawbreaker inspired by the incidents with Diggs and Cameron DeHall. Co-hosts Adam Savage and Jamie Hyneman, with help from then-Build Team member Tory Belleci and Mythtern Christine Chamberlain, strove to find out just how a Gobstopper or Jawbreaker could become a bomb. Jamie, on examining the insides of one, noticed that because of the candy's multi-layered makeup, there is a potential for a temperature differential — meaning that one or more layers could heat faster, causing pressure on the outer shell and making the candy unstable. (Christine found using an infrared thermometer that one layer got up to 225 °F (107 °C) after microwave heating.) If the candy was compressed — including in someone's jaws — the candy could explosively burst and its almost molten centers could cause painful burns. This was tested with a microwave oven and a jaw rig, but chemical contamination (specifically, through caustic soda, which is often used to clean food processing equipment) and heating while in the plastic bag were also considered confirmed. In the microwave oven test, Adam and Christine received light burns after a gobstopper exploded, and Adam compared the feeling to napalm because the candy was retaining heat efficiently.